The month-long promotion peaks this coming week - October 23rd-29th - when participating shops will help raise funds for a single rescue organization - Close to Home Animal Rescue. How does this work? First, click on the coupon image above - it will take you to a page on the guild's blog where you will see a list of participating shops. When you purchase an item from any of these artisans, use the coupon code 10CTH-CFA during checkout and 10% of your purchase will be donated to Close to Home Animal Rescue. Ever since I opened my ArtFire studio earlier this year, I've donated a portion of the sales of some of my products to WestieMed; since April, I've been able to donate $100 to WestieMed to help care for ill or injured rescued Westies. In September, I added Ramapo-Bergen Animal Refuge, Inc. (RBARI), a local no-kill animal shelter, to my charitable donations. Generally, anything with a Westie embroidered or printed on it and all of the Dog Collar Slipcovers benefit WestieMed; sales of Insulated Water Bottle Carriers and Dog Scrunchie Neck Ruffles benefit RBARI. 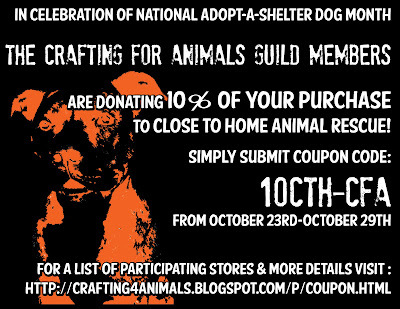 During the Crafting for Animals Guild promotion next week, you can use the coupon code for any items in my shop, and I'll donate 10% of the sales price to Close to Home Animal Rescue. As a thank-you, I have a special free gift item that I'll include with each package, too.